Donovan's Overpass has been demolished as part of a redesign of the highway system in and around the St. John's area. A demand for highways that are both wider and faster for commuters has been given as the reason for the structure's demolition. The structure entered into the provincial vernacular, with the expression "beyond the overpass" coming to mean anything in the province that was outside of St. John's. Like the similar expression "beyond the pale," the phrase "beyond the overpass" always seemed to imply a certain cultural superiority. The structure, and the phrase, generated a certain emotional response, and while the concrete bridge was perhaps nothing exceptional architecturally, it is (was) imbued with a level of cultural meaning perhaps unique in the province. The Telegram called the structure "infamous," while VOCM referred to it as a "cultural icon." CBC News said the bridge "symbolized the divide between St. John's and the rest of the province." As CBC's David Cochrane said today on his twitter feed, it was "our Berlin Wall." Love it or hate it, the overpass is no more. 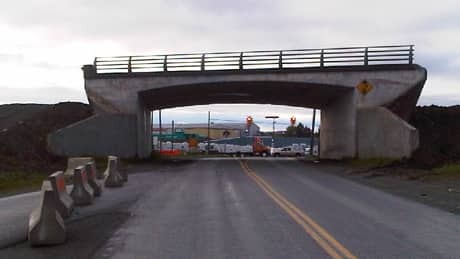 It will be replaced by a six-lane road on the Topsail Road stretch, and a four-lane "structure" serving Kenmount Road. I suspect the phrase itself will linger on, long after the $5.6 million to replace the overpass has been spent.